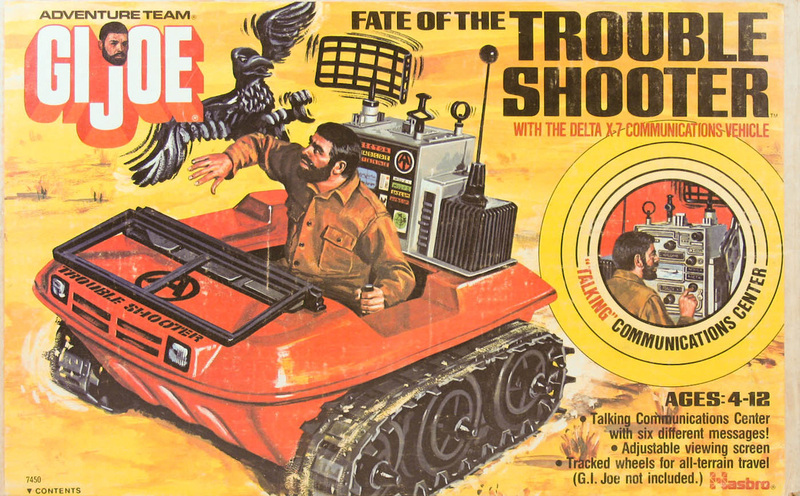 New for 1974, Fate of the Troubleshooter (7450) brought a number of upgrades to the classic Adventure Team Vehicle, starting with a change to a bold red color. In addition a windscreen and headlights and grille were added to the front, and the balloon tires replaced with durable tracks to handle tough terrain. The set also added a talking communications device powered by a D cell battery. This mechanism is the most delicate of Hasbro's talking mechanisms, and even when carefully cleaned and repaired they tend to conk out after awhile. The animal nemesis in the set is a crazed looking vulture.